Timed Email Organizer is one of our most overlooked add-ins. With its ability to organize your inbox on a constant or on an as needed basis (based on a set of rules that you define), it’s amazing that it doesn’t outsell our Power Rules Manager. Especially considering that the Power Rules Manager (which basically provides a nicer user interface than the native Outlook rules manager) can run out of space for the native rules (but see our article on How to save space in Outlook rules for help on this). 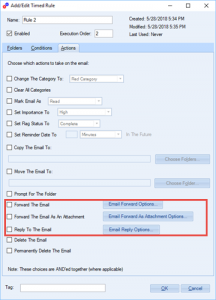 By contrast, the Timed Email Organizer can not run out of rule space. Perhaps though, maybe one of the reasons the Timed Email Organizer is often overlooked is because it has had one glaring omission in its repertoire of actions: the ability to forward or reply to a given email. 1) When an email arrives forward the email. 2) When an email arrives forward the email as an attachment. 3) When an email arrives reply to the email. You can configure the forward or the reply as necessary, including adding not just a To address, but also an (optional) CC or BCC address. 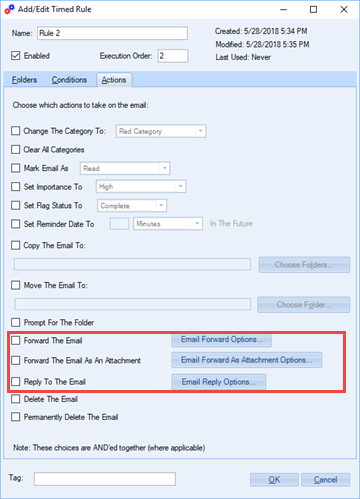 When it comes to forwarding the email as an attachment, in addition to the ability to add recipients you can also specify the subject and/or body. However when it comes to the ability to automatically reply to an email, the original subject can be preserved, included, or replaced. In addition, you can specify predetermined text that will be added to the body of the reply whenever it occurs. This handy feature basically mimics an autoresponder. Autoresponders are useful in a variety of ways and in fact many customers have asked us for this ability – now you’ll be able to save time by automating your replies. I’d love to hear more about how you might use these new features, drop me a note at sales@sperrysoftware.com. All you’ll need to do is to use that little pulldown to select which kind of recipients you want to filter on. Read more: How we deal with Junk Mail, which involves the use of this add-in combing through the Junk Mail folder. The jury is out as to whether these new features will sway people to begin using the Timed Email Organizer instead of the Power Rules Manager, but we will keep you posted. In the meantime, keep working IN email and not ON email! Message Timed Email Organizer. permalink.